We've been working together with internationally recognized orthopaedist and sports physician Dr Eduard Lanz for many years, and we're please to be offering two more of his very beneficial products – a cooling gel for joints and a warming muscle cream – for the first time in a completely natural form. "ArthroDisc WAX is used to ease muscle tension and increase circulation, while ArthroDisc Gel is used to reduce swelling in joints, tendon sheaths and joint capsules. I developed both of these products for the treatment of my own patients – they've proven to be effective over years of use. fangocur has successfully made these products even better – now we can offer them to you in an entirely natural form. This was not easy to do, especially in terms of the consistency and shelf life. The active ingredients were always 100% natural. I'm very pleased that I'm able to offer these new products to all of the valued fangocur customers." This is a gel for the connective tissue of the joints, including the tendinous sheaths and the synovial bursae. It reduces swelling thanks to its toning effect on veins and lymph vessels. It encourages the removal of harmful metabolic products from the tissue. This effective natural gel for joints and veins starts working straight away, and the cooling effects last and last. It contains devil's claw, aloe vera, menthol and camphor along with a combination of essential oils. 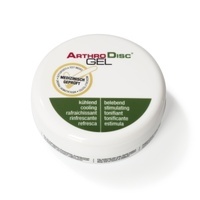 When used for tendonitis, bursitis and joint irritation, simply massage ArthroDisc GEL into the affected area. You'll quickly notice the cooling effects. Apply the gel several times per day – it's ideal if you can keep the gel cool prior to application. Do not use on injured or irritated skin, varicose veins or mucus membranes. Not suitable for babies or young children. Avoid contact with eyes. This is a warming muscle cream that both relieves pain and increases local circulation. Use it to sooth and relax tight muscles. It contains devil's claw, wintergreen oil and chilli pepper extract. 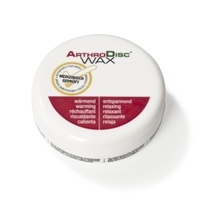 Apply ArthroDisc WAX to areas affected by muscle spasm, muscle soreness or tension. You'll quickly notice the warming effects. Apply the cream several times per day. Do not use on injured or irritated skin, varicose veins or mucus membranes. Not suitable for babies or young children. Avoid contact with eyes.